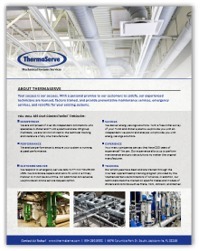 ThermaServe is a customer driven South East Regional Independent Commercial and Industrial Mechanical and HVAC Systems Services Company serving North Florida and Southern Georgia. Founded in 2000 by the Royer family, the company has over 250 years of combined technical experience on major manufacturer’s equipment including Trane, York, McQuay, and Carrier. With a personal commitment to our customers, our experienced technicians are licensed, factory trained, and provide preventive maintenance services, emergency services, and retrofits for your existing systems. Your success is our success. We provide service on large chillers. As the only North Florida / South Georgia member of the Independent Contractors Exchange, we are comprised of over 45 independent contractors who specialize in chiller systems service, with its members performing service annually on over 10,000 chillers. 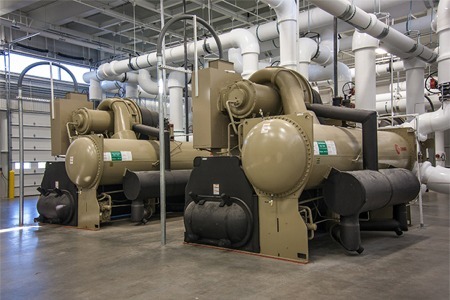 As independent contractors, ICE group members are uniquely qualified to service all makes of chillers since they are not limited to the technical training and literature of any one manufacturer. This relationship allows us access to support and specialty parts for a broad range of manufacturers. We analyze chiller performance. As part of our service offerings we provide operational performance testing of chillers and total chiller plants using a power analyzer to provide actual real time energy efficiencies (KW/ton). This provides us with the information to adjust or recommend a cost saving replacement chiller for optimum performance. Over 250 combined years of experience. As an independent our experienced technicians are licensed and factory trained and our technical staff have a broad range of manufacturers equipment background and can provide you with solutions to problems that you may have with your chiller and HVAC systems, regardless of the original manufacturer. We respond to your unique needs. We respond to EMERGENCY SERVICE calls within 2 hours or less during regular working hours and can respond to your non-emergency requests within 24 hours. Your call will be received by our professional staff, and we coordinate repairs and retro-fit work to minimize down time. For your convenience we also provide an online service request option. In addition to years of experience with OEM’s and other independent Mechanical and HVAC companies, our employees have been or are trained through the Five Year Apprenticeship training program provided by the Mechanical Service Contractors of America. Upon completion of this program, which is the equivalent of a Bachelors degree in an applied science, they earn a Journeyman’s License. We also send our licensed technicians to Original Equipment Manufacturer’s schools on specific makes and models of chillers and chiller controls, including Trane, McQuay, Johnson, York and Carrier. ThermaServe is a customer driven South East Regional Independent Commercial Chiller & HVAC Systems Services Company serving North Florida and Southern Georgia. With a personal commitment to our clients, our experienced technicians are licensed, factory trained, and provide preventive maintenance services, emergency services, and retrofits for your existing systems.